Bromley is the first tea company in America to offer a decaffeinated tea, so by serving Bromley, your patrons are sure to receive a perfected recipe of quality decaf tea. Even if your patrons do not want caffeine, they'll be able to enjoy fresh, great-tasting tea thanks to the full-bodied flavor of these Bromley Exotic orange pekoe decaffeinated tea bags. Decaffeinated using an all-natural, non-chemical process, this special blend of teas comes from exotic locations and has a smooth, orange flavor. Great tea, similar to Stash and they come in many flavors, we also bought the rack they have for counter storage. staff loves it too, and they're cheap. The Bromley exotic orange pekoe tea is great and smells so good brewing. The tea is a nice variation and really good served iced with fresh orange wedges. These are my favorite tea. Smells orange but not sweet or sour. I They taste great, and I can drink them at night because it's decaffeinated. Will order from again. I love orange pekoe tea, but I am new to this brand. I tried it and loved it, I make a cup to sip on at bed time. It’s a great tasting tea, definitely recommended! Our customers love this delicious decaffeinated herbal tea! This brand has great quality teas! Each delicious and a good variety to choose from as well! The exotic orange Pekoe decaffeinated tea is so delicious and refreshing. A great tea for our bakery and its great hot or served over ice. The Bromley exotic orange pekoe decaffeinated tea is unique but great. The flavor is a bit herbal and the orange hints are delightful. A great tea for any occasion. So far very pleased with Bromley's teas. The price is really good and the flavor is very nice. On a cold morning, a cup of this orange pekoe is just the thing to start the day off right! The Bromley exotic orange Pekoe decaffeinated tea is wonderful and delicious. I love the great orange citrus flavor and the tea is great for night time drinking. This bromely exotic orange pekoe decaffeinated tea has a strong citrus taste. There is 24 tea bags in the box. This is a great tea for the evening since there's no caffeine in this tea. The Bromley Exotic Orange Pekoe Decaffeinated Tea has a great taste and steeps well. The citrusy taste is pleasing and the aroma is inviting. I would recommend this! As an avid tea drinker the aroma seems to be almost as important to the taste and this one hits the spot!! Love the natural flavors and the fact that it’s decaf is an instant bonus! The orange flavor of this tea is phenomenal. The value of this product can’t be beat considering you get 24 the bags. I love the flavor!! The exotic orange pekoe tea is so tasty. The orange citrus flavor is great and very good drinking quality. I love that is decaffeinated and so I drink it late in the evenings. This exotic orange tea has a very nice flavor and a smooth finish. Having a decaffeinated tea on hand is important because sometimes our guests do not want caffeine after their meal. This tea is great for those who want more flavor then a regular black tea. Delicious subtle orange flavor in this tea. I love drinking this right before bed and the decaf tea will not keep me up all night! A good fruity decaffeinated tea that is perfect served chill. The tea is very potent and has a great smell. Serve over ice with an orange wedge. Good, pretty standard decaf black tea. I like it cold brewed with an herbal teabag to give it some fruity flavor. It's good sweetened or unsweetened. This tea is perfect for the evenings when you don't want to have caffeine before bed. It has a great orange taste and also has antioxidants which are healthy and great for you. I had never ordered this twenty-four pack of Bromley Exotic Orange Pekoe Decaffeinated tea before and have to admit I am so glad I took the chance because it is delicious. While I stuck to the hot version of this tea, my wife went with an iced version and was just as pleased. The aroma will freshen any room with orange and I definitely taste the strong orange flavor. I would highly recommend. Such a interesting flavor combination! You will definitely appreciate originality of this tea! You will enjoy every single cup! Great choice for any tea lover! This review is for Bromleys Orange Pekoe Decaffeinated 24/ box tea! We give 4 stars! Each bag is individually wrapped in foil to preserve freshness! Tastes great! The name of this tea sounded wonderful, but I found it to be a bit lackluster. The flavor just wasn't as strong as I was expecting. Nice, smooth black tea. I love that it's decaf so I can brew it in the afternoon and enjoy it iced or brew a warm cup of tea after dinner in the evening. The orange flavor is very nice. It adds just the right something. It tastes more like a hint of orange rather than tasting like it had powdered orange flavoring or such added to it. It has a nice flavor. Always loved the taste of organize tea. These are high quality and are priced great. This brand is the only tea we sell, and people already love it. One of the smoothest black teas you will find with a hint of orange flavor. Bromley's teas do not disappoint and this one is no different. One of my fav! Love this brand of orange pekoe tea. And it's decaf so it's good have a pot brewing all day. So good for afternoon tea too! Had a very subtle flavor relative to the bigger named brands of this variety of tea. It's strange enjoying it hot when it's mostly enjoyed ice cold. The extra for me is that it's decaffeinated, so no more jittery down times. The fact that Bromleys carries such a variety of caffeinated and decaffeinated teas is amazing to us. We love black, green and assorted teas and never have an issue choosing from Bromleys. A pure taste that can be enjoyed by many. You can still enjoy tea even if it is decaffeinated. 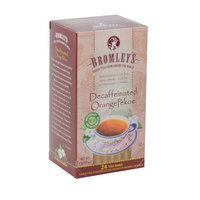 Bromley Exotic Orange Pekoe Decaffeinated Tea - 24 / Box tea has never been easier to enjoy. Simply pour hot water, let steep a few minutes and enjoy on the road. Orange Pekoe decaffeinated tea is a very nice tea. I love the orange flavor and cannot tell it is decaffeinated. The flavor is mild but very pleasant. I have used it as iced tea and the flavor makes it one of my favorites. Put a sprig of mint in the glass for a pleasant fragrance as well as a great taste. In looking for mor Decaffeinated teas, I'm So happy to have found Bromley a Exotic Orange Pekoe Eecaffeinated Tea. The taste is good and my clients like it. So, I LOVE IT! Not that high grade of a tea. The flavor is almost non-existent in this tea. There are much better black tea's available. Overall not very impressed with this tea or brand. We appreciate your review, Michael! If you are looking for a tea that would better meet your expectations, please contact our Customer Solutions team for a recommendation. The orange tea tastes delicious; it is very flavorful. It's also nice that it's a decaf option. The package is very nice and it fit's beautifully in the Bromley Tea Holder. I've been searching for a decaf tea that has not been de caffeinated using chemicals!!! This tea is naturally done and tastes fabulous !!! I will search no longer. This is the one. This tea, i have heard about it but not an adventurous person, until my close friend offers me the tea, it has a smooth taste to it.